The Boeing 787 and its future rival the Airbus A350 XWB will be made as much or more from composite materials as from metal. Extensive use of composites in these aircraft should make them much more comfortable for passengers to fly in, as well as making the aircraft more efficient and environmentally friendly. If you takea long international flight ten years from now, there's a good chance theairliner carrying you will be made as much out of plastic as metal. But not just any plastic. Tomorrow's airliners will make extensive use of advancedcarbon-fiber composite materials, much stronger and lighter than thealuminum parts they replace. 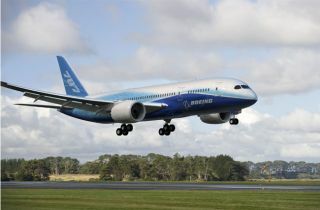 The entirefuselage skin of Boeing's new 787 twin-engined widebody jet, due to enter service in 2008, willconsist of composites. The skin and spars of the 787's wings are made ofcomposite material too, though the ribs that shape and stiffen the wing fromfront to back are aluminum. "We lookedat how every part of the aircraft was [stress] loaded, and we chosethe right part for every given application," said Tom Cogan, chief projectengineer on the Boeing 787. For instance, Boeing used titanium for the largefittings joining the 787's wings to its fuselage, because "it's very light andit does very well in a highly loaded situation." Today'sairliners make use of composite materials, but not to the degree that the 787and its future rival the AirbusA350 XWB will. Composite materials make up "roughly 50 percent" of the 787,said Cogan. The A350 XWB, which won't enter service until 2013, willbe morethan 60 percent composite. Airbus wasthe first manufacturer to use composite materials for load-bearing parts andflight control surfaces in airliners, but Boeing chose to use composites forthe 777's floor beams when designing the big twinjet in the 1990s. Compositematerials confer several major design advantages. Apart from being very lightand very strong, they don't corrode and they aren't subject to metal fatigue. Theearliest-built 777s have recently undergone their first "heavy checks"--major structural inspectionsduring which the aircraft essentially were taken apart, examined extremelythoroughly and rebuilt-- and their floor beams were "pristine," said Cogan. "Wehaven't sold a single spare floor beam." This isgreat news for airlines. In the course of normal operations their jets aresubject to extremes of heat and cold and--particularly on transoceanic flights--flyfor long periods in moist, salt-laden, corrosive air. Employingcomposites to a greater degree will make airliners more reliable, lettingairlines fly them more while keeping maintenance costs down. It will also makeairliners lighter, reducing fuel costs and allowing them to carry morepassengers and cargo--or fly longer distances--at their maximum takeoff weights. Tomorrow'slargely composite airliners also will improve the flying experience forpassengers. Makingairliner fuselages out of composites banishes the fear of metal fatigue andcorrosion that has constrained designers until now. Passenger-cabin air can bemoister and kept at higher pressure, so passengers feel less dehydrated anddon't find themselves gasping for breath. Breathing in today'sjets is like breathing at the top of an 8,500-foot mountain. But the 787 will have a 6,000-foot cabinaltitude, making it much easier to breathe. Passengerwindows can be much larger, too. Each 787 window is some 30 percent bigger thantoday's cabin windows and window-height difference is particularly noticeable.The 787's windows will extend above seatback height, so passengers sittingbetween the aisles can look across and see outside. "We like tosay every seat is a window seat," said Cogan. Building onthese advantages, Boeing has adopted other technologies to make passengers feelcomfortable on 787s. It is usingLED lighting to create a cabin lighting environment that can vary with the timeof day from a restful pastel-colored glow at dawn and dusk to brighter daytimelighting and a subdued midnight-blue shade in late evening. Additionally,not only does the 787 cabin environmental controlsystem employ HEPA filters to keep the air free of particles as small asviruses, but Boeing also has incorporated a gaseous air purification system to scrubout even smaller molecules, to keep the air aroma-free. "Actually,the air onboard will be cleaner than the outside air," said Cogan. Sinceoutside air at high altitude is very dry but people generate humidity, Boeing787 pilots will tell the aircraft's computers how many people are on board andthe computers will manage cabin humidity levels by drawing in greater or lesseramounts of air from outside. The 787 won't need cabin humidifiers. Passengerswon't notice all the advanced technologies used in the 787 and the A350 XWB.But one they will notice is the use of dynamic load alleviation to reduce gustforces. Sensors inthe aircraft's nose will sense lateral and vertical wind gusts as it begins toencounter them, allowing its flight computers instantly to move the aircraft'sflight control surfaces to reduce the loads. This means the aircraft can have alighter design structure--but more importantly for passengers, the flight willfeel less bumpy.